Irit Kelman brings 18 years of legal and investigative experience to Rubin Thomlinson — including sensitive, intelligent investigations of gender identity discrimination, racial discrimination, failure to accommodate, sexual harassment, and personal harassment complaints. Irit’s strong insight into social and cultural issues, unflagging fairness, and skillfulness at getting to the bottom of a situation — even amid rumours, staff or managerial reluctance, and other complicating factors — are especially invaluable. Irit is a compassionate listener, who sees investigations as an opportunity for all parties to finally feel they are heard. At Rubin Thomlinson, Irit fields a diverse range of workplace investigations, including complaints of sexual harassment, racial discrimination, and other forms of misconduct. Irit is also available to help organizations proactively identify and curb dysfunction through workplace assessments and reviews. Finally, Irit is an engaging and experienced trainer, who provides workplace investigation and human rights training to staff at all levels. 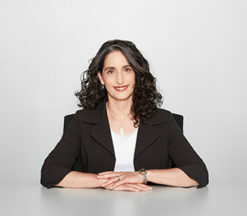 Before joining Rubin Thomlinson, Irit served for over 15 years in senior human rights roles at Sinai Health System and the City of Toronto. This high-stakes work included planning and conducting successful investigations and assessments; correctly applying corporate policies, legislation, and case law; making practical and equitable recommendations to address investigation findings; developing and delivering training on diverse topics; and directly contributing to policy development and organizational change. Irit also previously served at a prominent labour law firm, presenting legal cases (both in person and via written submissions) at the Grievance Settlement Board, Ontario Labour Relations Board, College of Nurses of Ontario, Ontario Human Rights Commission, and private labour arbitrators.